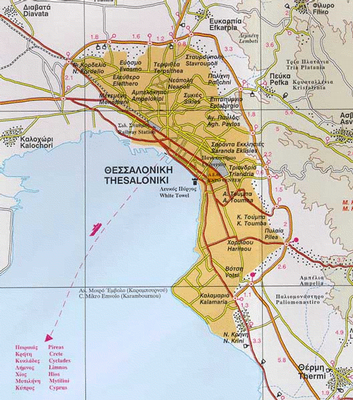 Greece's second largest city, capital of Macedonia in the north, was the realm of Alexander the Great and named after his sister, Thessaloniki, when it was founded in 316 BC. It sits in a bowl framed by low hills, facing a bay on the Gulf Thermaikos. Despite being one of the oldest cities in Europe, today Thessaloniki is lively and modern, with wide avenues, parks and squares. In 1917 most of the city was destroyed in a massive fire, and rebuilt later. This is not a high-rise city, though, because the area is prone to earthquakes and regulations have been imposed preventing the building of skyscrapers. This means that residents and visitors alike can enjoy the seaside situation of Thessaloniki, with views aplenty from the city streets. The main squares are Platia Elefterias and Platia Aristotelous, both on the waterfront and alive with cafes and restaurants, children playing or people just strolling. Thessaloniki, having been under Ottoman rule for long periods in its history, has been left a legacy of numerous Byzantine churches, and museums housing Byzantine art and artefacts. The city also has a heritage of early Christian communities, particularly the renowned monasteries of nearby Mount Athos. The city’s most famous landmark, the White Tower was originally built as part of the city walls. It now stands, no longer white but still imposing, on the seaside promenade south of the Archaeological Museum, having been restored and offering panoramic views of the city and harbour from its rooftop café. The tower was once used as a prison, and on the way up the winding staircase visitors can peep into the dim rooms that were used as cells. The tower contains a museum housing some Byzantine art and historical artefacts from Thessaloniki’s history between 300 and 1,500 AD. Vergina, known in ancient times as Aigai, is about 61 km west of Thessaloniki and is the most important of a cluster of three archaeological sites in the area connected with Philip, father of Alexander the Great. Vergina is where Philip built a massive palace and a theatre, and where he was assassinated in 336 BC. The palace has been excavated, as has the theatre and the site also features hundreds of burial mounds, some dating from the Iron Age, across the plain. The tomb of Philip was found here undisturbed in 1977, full of treasures that are now on display in Thessaloniki’s Archaeological Museum. Nearby is Pella, the remains of the former capital of Macedonia from the 5th century, where Alexander the Great was born; and Dion, an important religious sanctuary frequented by Philip and Alexander.